A US marine scientist in California who has been studying an octopus with no formal name decided to call the specimen "adorabilis." The presently unnamed deep-sea creature is just too "cute" to resist assigning it such a name, she says. "As someone who is describing the species you get to pick what the specific name is. 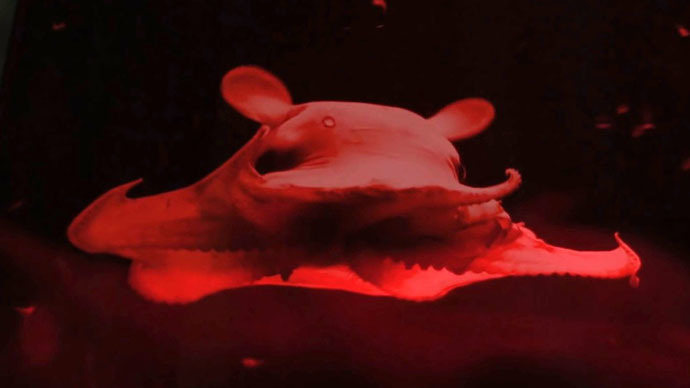 One of the thoughts I had was making it Opistoteuthis adorabilis - because they are really cute," Stephanie Bush of the Monterey Bay Aquarium Research Institute (MBARI) told Science Friday. The researcher has been studying the tiny anonymous octopus from the genus Opisthoteuthis for many months. She says the deep-sea cephalopods "are really gelatinous and fragile, and they have relatively large eyes for the size of their body." The "cute" marine animals have a well-developed web between the arms – "they'll just spread that web and kind of parachute along," Bush said. She added that understanding behavior of individual species is an important task, "in order to have a healthy functioning ocean eco system." MBARI scientists collected several of the octopuses live last year as part of its ongoing research off the California coast. Having lived at the Monterey Bay Aquarium, one of the octopuses has laid eggs. Dozens of eggs have now been developing for over a year, and the rare marine creatures inside them are not ready to hatch out of the eggs yet. They have a lengthy incubation period, and researchers might need to wait for up to three years before more "adorabilis" octopuses are born. Classifying and naming a specimen is also a long process that could take years, it appears. "It involves publishing papers, collecting specimens and distributing them to museums around the country," Kim Fulton-Bennett, a spokesperson for MBARI, told Science Friday.